Dr. Hoidal is trained on advanced dental implant procedures to restore your oral comfort and function. These procedures include immediate implant loading to reduce treatment time and discomfort, implant stabilization of denture appliances, and sinus lifts to provide greater bone stability. One of his highest priorities is patient education. During an initial examination and consultation, he will discuss all options for treatment and help you come to an informed decision. Please do not hesitate to voice any questions you may have. 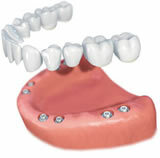 With a bridge, healthy teeth on either side of the missing tooth are shaved down for a bridge that fits on top of them. An implant, on the other hand, is anchored on an artificial tooth root. This leaves the adjacent healthy teeth undamaged and helps preserve bone structure. Dental implants can now be used to anchor partial and full dentures. This prevents the slipping, irritation, and pain associated with "floating" partials and dentures. It also prevents the tedious removal of dentures for overnight soaking and cleaning. 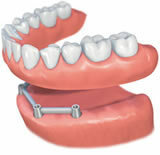 Dental implants also eliminate the need for dental adhesives. This allows you to enjoy eating the foods you previously avoided . With dental implants, your partials or dentures are firmly anchored to the jawbone, causing them to feel much more like natural teeth. 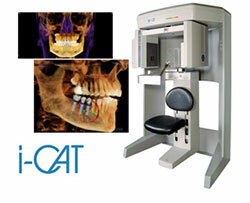 A key to dental implant safety and success is advanced radiography. A CAT scan ensures that every possible precaution has been made to reduce the risk of involvement of the nerves in the lower jaw, and the sinuses and nose in the upper jaw. This helps to reduce chair time and the possibility of complications. Until recently, CAT scans were only done in hospitals or medical facilities. Dr. Hoidal is proud to be able to provide this extra level of precision and safety to his patients. A critical question in determining whether an implant can be placed is, "Is there enough bone to support the implant?" Fortunately, advanced bone regeneration techniques now make it possible to place many more implants than just 10 years ago. Lake Oswego Periodontics is rated 4.9 out of 5 based on 23 reviews from around the Web. A great experience, even though it was gum surgery. A wonderful staff, terrific doctor and a beautiful view to boot! Dr Hoidal is the best! I highly recommend him. Everything is now sound and the new bridge is on its way.At all times, I was very pleased with his approach, thoroughness of his diagnosis and plan, and his manner. All the staff and Dr. Hoidal are terrific! Friendly, professional care of the finest quality. Great experience! Dr.Hoidal and staff are amazing. Great experience! I was also impressed with his staff, from the front desk, the scheduler, the dental assistants. They too know what to do and how to do. A very friendly office staff which makes patients comfortable the moment they enter the office. Dr. Holidal is very professional and keeps his patients appraised of all the procedures he is doing. I can highly recommend this clinic. Great staff & calming views of the river too.